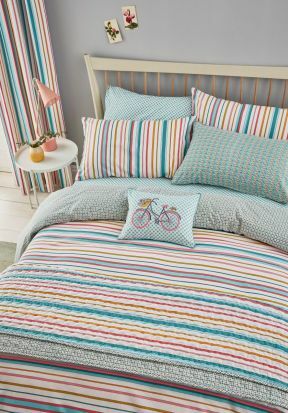 This lovely, bright striped duvet cover set from Helena Springfield will give a great lift to any bedroom. The eye-catching blues, pinks and yellows in the linear design are complemented beautifully by the repeat-pattern reverse, and the set can be enhanced by adding the matching cushions, throws and curtains. The Trixie design also crosses beautifully with the Helena Springfield Mary Jane design, allowing you to mix and match elements from each to create your own stylish bedroom look.